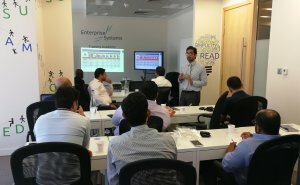 Enterprise Systems’ training academy offers partners and solutions providers specialist training and development programmes to deploy its brands efficiently. Training is a fundamental activity for any organizations of any size. High-level training combines technical & business training, brand awareness, and research & development initiatives. Enterprise Systems Trading LLC has launched its Training Academy at the start of 2018 to provide specialist training and development programs for sales, pre-sales and post-sales for all our brands. Enterprise Systems Academy will offer sales and technical training aimed at front-line staff, managers and leaders, and those responsible for delivering services to your end users. For every level of knowledge and expertise, Enterprise Systems Training Academy can enhance your ability to effectively deploy and use the applications and technologies we distribute. Programs are available by area of focus and for different skill levels. Courses include rigorous study and hands-on learning, complimented by tests and exams to validate your competencies. The skills and knowledge you demonstrate through training can help you make an immediate impact on current projects and help you achieve excellence in your field. It will also help employers respond to the changing demands of your clients, who identified knowledge, attitude, behavior and competence as the factors most likely to affect purchase, re-purchase and recommendations. The Enterprise Systems Academy will have a clear focus on people development and assessment to recognized standards, helping employers recruit and retain staff with the required skill-sets. Pouya Parsafar, CEO of Enterprise Systems, said: “End users are increasingly suggesting that the knowledge, attitude and behavior of the sales/technical person managing them is more important to them than it was five years ago. At the same time, sales people are asking for help, so they are better equipped to handle their customers’ demands. All programs will be designed to achieve benefits for individuals and their organizations with results driving improved service delivery. Enterprise Systems Academy programs will also develop a range of skills including emotional intelligence, effective communication, team-working, training delivery and coaching. Enterprise Systems Training Academy regularly creates exciting incentive programs tailored to our partners’ needs. Our incentive programs are designed to motivate your sales, pre-sales and post-sales team in order to secure and deliver solutions from our leading vendors’ portfolio. Enterprise Systems Academy has assessment which will address current customer service issues and known skills shortfalls against customer expectations which will help organizations fill their skills gaps and improve employee engagement. This is based on hands on training based on real scenario for sales and technical. Enterprise Systems Academy can also offer one on one training for clients with specific needs based on specific end user needs, with capability of advanced staging and project simulation. Enterprise Systems Academy use high quality instructors with high partner & vendor satisfaction score. Our tutors have over 15 years of experience working with networks & partners and our tutors can bring hands on experience to students. Enterprise Systems Academy course schedules are available by visiting training@esystems.com for more information.